An event like no other! In aid of Wales Air Ambulance. The next WRT & WRT Lite will be on 4/5/6 May 2019. If you're a business and would like to donate any prizes for the draw, please contact us asap so we can start promoting your association with the WRT. Imagine an event that lasts 3 days, where there's no set route. One where you get to decide how far you're going to ride and where you're going to stop. 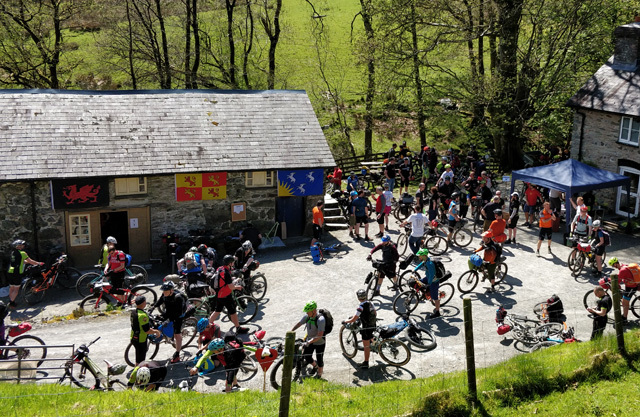 A truly non competitive event where the only goal is to get out on your bike and enjoy yourself … what you're imagining is the WRT and what it lacks in rules, it makes up for in adventure. Since its inception in 2009 the WRT has acted as the perfect introduction to bikepacking for hundreds of riders, with many returning year on year to get their fix. The concept is unique and deceptively simple, a month before the start, a set of grid references are sent out to everyone riding. These reference points form the outline of you're route and you can choose to incorporate as many or as few as you like … they usually point you in the direction of good trails or overnight spots. Some people will devise a real epic and include all the points, others will only use one or two and a percentage of riders will ignore all the references and base their route entirely on the locations of pubs and cafes! Over the years the start of the WRT has become an integral part of the event. The infamous 'weigh in' has become hotly contested with riders vying to be awarded the honour of lightest loaded bike - sadly many have their ultralite aspirations crushed by the scales of truth. Besides the 'weigh in', the start also plays host to a prize-draw with prizes donated by the cycle and outdoor industries. It is also fast becoming a showcase for new products and bikes. The 'ride' part of the event starts around 1.00pm when someone mutters a few words which will end in 'off you go' … what happens over the next 3 days and 2 nights is entirely up to you. The WRT doesn't have an official finish time, you get back when you get back which for the majority means sometime on Monday afternoon. For many the finish of the WRT holds a special place in their hearts which I'm sure is largely due to the amount of tea and cake on offer plus the chance to swap stories and re-live your adventures before heading for home. In 2013 the WRT-lite was introduced to give anyone who wasn't able or didn't want to spend 2 nights out, a chance to take part. The format remains largely the same with a couple of exceptions. Firstly, the overall number of grid references is reduced and a few 'closer to home' ones added. Secondly, the finish day is brought forward from Monday to Sunday but I'm glad to say the cake and tea fest remains unchanged.